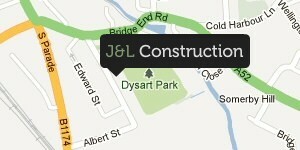 At J & L Construction we offer a wide range of building services to residential and commercial clients. With a wealth of knowledge in the building industry, we are experienced in the planning, designing and project management of all types of building projects and services whether they are large or small projects. We have built a strong reputation by continually producing a high standard of building work every time, and we pride ourselves on our friendly, honest, reliable and professional approach to always achieve the goals you require. With many years’ experience in the industry and a team of dedicated tradesman and sub-contractors we are able to deal with any aspect of building work, be it new house build, renovation of a property (old, new, listed or unlisted), small to large extensions, patio, decking, driveways or simply plastering a wall. No job is too big or too small. We also offer free advice and no-obligation quotations service to help you achieve the overall goals you require.